Although it is absent from the stage, Iran is nevertheless taking the spotlight at a Middle East security conference co-hosted by the United States and Poland that has highlighted deep divisions between the U.S. and some of its traditional allies. In a bid to encourage better participation, Pompeo and others sought to broaden what was initially advertised as an Iran-centric meeting to include the Israeli-Palestinian conflict, the fight against the Islamic State group, and the conflicts in Syria and Yemen. That effort produced only mixed results, particularly with longtime European allies who are trying to save the 2015 Iran nuclear deal after last year’s U.S. withdrawal. And, while the agenda gives no hint of any concrete actions that might result beyond creating “follow-on working groups” on a variety of common concerns like terrorism and cybersecurity, comments from several participants belied the underlying theme: countering Iran. Pence will address the conference on a range of Middle East issues, Pompeo will talk about U.S. plans in Syria following President Donald Trump’s decision to withdraw U.S. troops and Trump’s senior adviser and son-in-law Jared Kushner and his peace partner, Jason Greenblatt, will speak about their as-yet unveiled Israeli-Palestinian peace plan. Greenblatt, whose portfolio extends only the Israeli-Palestinian peace effort, said Iran is the top priority and derided the Palestinians for their boycott and insistence that their case is the region’s most important issue. Netanyahu sent out a belligerent rallying cry to his Arab partners, saying he planned to focus on the “common interest” of confronting Iran. He made the comments during an off-the-cuff interview with reporters on a Warsaw street, shortly after meeting Oman’s foreign minister. Pompeo has predicted that the conference will “deliver really good outcomes” and has played down the impact of lower-level participation. “We think we will make real progress,” Pompeo said. He didn’t, however, offer any details about specific outcomes. “We consider this to be a valuable element on the international arena,” Czaputowicz told a joint news conference with Pompeo on the eve of the conference. In a joint opinion piece published Wednesday by CNN, Pompeo and Czaputowicz said they didn’t expect all participants to agree on policies or outcomes but called for an airing of unscripted and candid ideas. In fact, three of Washington’s main European allies, Britain, France and Germany, have unveiled a new financial mechanism that the Trump administration believes may be designed to evade U.S. sanctions on Iran. British Foreign Secretary Jeremy Hunt is attending the Warsaw conference, but his main interest is in a side meeting on the conflict in Yemen, according to diplomats familiar with the planning. 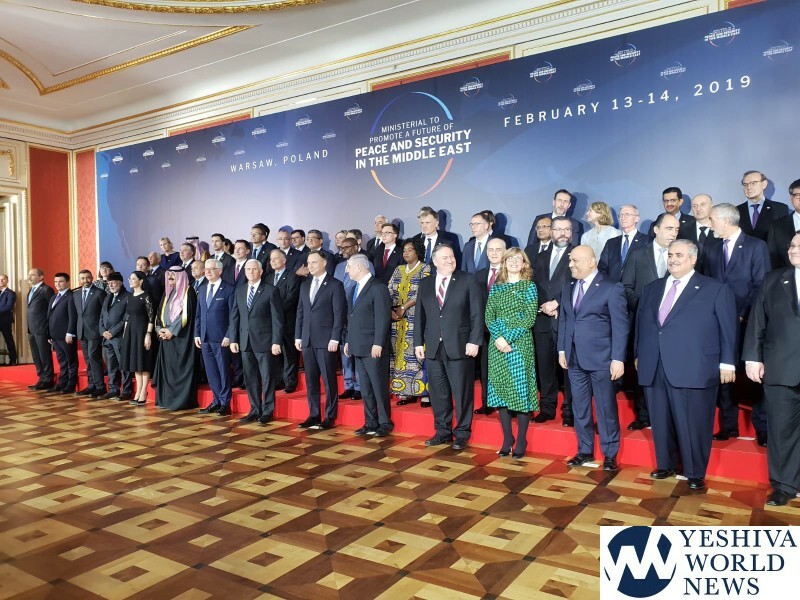 “The result of this conference ideally would be a demonstration of Iranian isolation and unity amongst American allies in Europe and the Middle East,” said William Wechsler, senior adviser for Middle East programs at the Atlantic Council in Washington. “Time and again, this administration had found itself drunk on its own Kool-Aid, isolated from our friends, and belatedly forced to scramble to save face,” Price said, adding that not a single country in the EU endorsed Trump’s pullout from the Iran nuclear deal. Israel has had no peace in 70 years. It is NOT in our hands by military solutions.